The panel had split up to summarise the different strands of the conference. I didn’t know everyone on the panel and should have noted the names as they were introduced by Will Swann so apologies to Lindsay and Becky, though I caught Liz Hall who is leading the development of the OU’s National role, and I know Bob Lambourne leader of the piCETL, Chris Pegler, and Martin Weller. Lindsay reported on the student experience – and the issues of how we measure it – and the way we try to intervene to change it. Becky (working with employers strand) – employer engagement is an opportunity and threat. Bringing together activity like this shows the range of existing activity.OU does still have USP around consistency, excellence in teaching, technology, and expertise in the learner experience. We are also learning a lot by working with employers and listening to them. A quick hands up in the hall led to all but one person seeing it as an opportunity (what does he know that we don’t!). Liz Hall had looked at the academic work on employer links, while Bob talked about the way in which the CETL work had impacted across the conference: with good work on synchronous links, past use of Lyceum and future use of elluminate. Bob deliberately ended on a couple of negatives – the problems of technology (illustrated in the way it even impacts on presentations in the conference and so we can expect this to hit students). The other negative is the lack of academics in the audience. Poll: ALs, students, Regional, Central academic. Majority were central academic but I still take Bob’s point that we are talking to the converted. Chris: lots of interesting things going on but we must disseminate (repeating a quote Phil Candy had used – “research not published = research not done”). Chris talked about sessions that I had missed where FlashMeeting (another OpenLearn technology) had been used for joint project work. She described delighters and exciters. 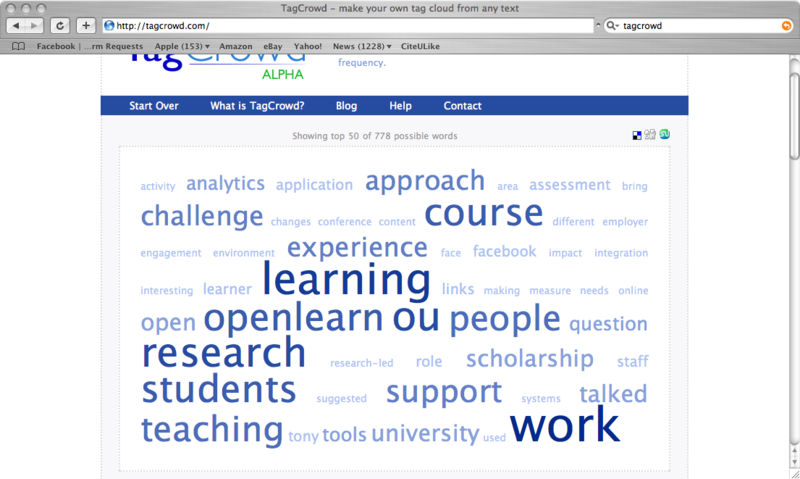 Martin presented both a tag cloud (in fact two – the abstracts and the discussions) and the crowdstatus of the twitters we made. Terry Di Paola talked about an online assessment light course (U122) from or Centre for Outcomes Based Learning. The course was trying to bring in people who are not embedded in education. The authoring was through good practice, case studies and then building into reflection on past learning. Work contexts and futures. There is a clever approach of verification – perhaps not that different from how we need to get people to verify passport applications. The way in which this would scale is a challenge but the portfolio approach (using the OU’s mystuff), an interesting question is how we could accredit the accreditors (verifiers). Terry responded to a question from me that this would be an ideal course to look at operating in an open way – recognising though the vital role of the tutors at the beginning and end of the process. There are some awkward issues about the assessment but probably not unsolvable. John Woodthorpe also talked about user-generated course content. Their product is fOUndIt at http://foundit.open.ac.uk – while it crosses over with similar tools (digg and perhaps a bit of del.icio.us) the use is around a community and the way in which a course “stub” gets extended to gain content through learner activity. The rating and commenting looked good. Suggestions were to rapidly scale this up, and how to manage the competitive and collaborative elements in recommending sites. As long as finding the resources is not the main point (analysis is). The site is separate from OU systems that releases some control but gains in terms of how people interact. The work on Openid that was part of OpenLearn and now needs to feed into the BioDiversity lab could well help this mix of OU and open systems. Darrel Ince, Head of Computing talked about a project “Let the students do it” to produce a student generated course. He said that this was part of an approach to challenge the OU. The particular course he described introduced elearning to the students, where the main output is 10 weeks of producing a course – with the best of the assignments becoming an OU course. A wiki will be used as the authoring environment – though at first on an individual basis (collaboration may follow). The course will be finished in May – delivered in October 2009. The courses to be generated at first was suggested as “Computational Intelligence”, “Computer music” or “Web 2.0” –intention at the moment to look at Web 2.0. Funding now for 120 students to write a book on Computer Music together with Oxford University Press and AuthorWorks print on demand. Overall approach 20 weeks in e-learning. Select and agree topic. Work with one other student. With a focus on the chucks that are produced. The output could be on OpenLearn, with the aim that output is Creative Commons. Interest also in OU staff taking the course in the first phase. In tune with companies like 37signals where there is a switch to consumer production. Tony Hirst is presenting on the FaceBook application in a pink “on-brand” T-shirt to contrast with his off-brand work on Facebook. Facebook is a huge success (though I feel some people I know are drifting away from it) The OU is well represented on Facebook with ome of the motivation getting away from the formal OU systems. So part of what was behind Tony’s work was to proide something into this informal space. The application used a design principle that there was to be no use of records but did build on voluntary actions. What is great is that they extended this to include OpenLearn. The use has grown rapidly to about 5000 out of 6-7000 OU users on facebook. This unofficial data collection has drawn out links that show intentions – potentially very useful. A question was asked about appearing in facebook as a tutor – Tony’s view is to join but make sure that it is clear that this is a social space for you as well as them – just like meeting people in conferences. Paul Lefrere suggested that this could scale up by as a way to manage identity as a neat application. President for student association runs the social side of FirstClass. The openness of systems can go against the wishes of course teams – making it awkward for them. The answer is that such sites have their own rules. Day 2 of the conference starts with Brigid Heywood, Pro Viice Chancellor Research and Enterprise continuing with the made conference theme of scholarship. As the person responsible for the measurement of research she emphasised that work on how to measure progress on the schoalarship dimension is also important referring back to work by UNESCO and the Carnegie Foundation – Scholarship Assessed (1997) . She then identified the issues for academics and the convergence of research, learning and teaching. Seeking to avoid the classic research v teaching to scholarship and its application to learning in a research-led environment, and how this can then feed in to the student experience. Teaching is the promotion of learning to students. I was unsure whther she means to challenge this view or support it. I think a mixture as she digs down into the way we challenge students and the need to apply this to how we can build a research-led learning environment. (RLLE anyone?). And the need for research, learning and teaching to be integrated. As a test of institutional commitment she suggested that a key is whether the institution plays a formative role in supporting (or blocking) the links between research and learning. Probaby achieved through integarion of research strategy with learning and teaching. At the faculty level this turns into specified staff roles and direct organisation. Which then needs to be reflected in the curriculum with understanding of research-led learning (or she said she might prefer research-informed learning). Project work or project study. Gill also described a variation of a research-based learning environment – which applies into the programme as well as at the philosophical level (e.g.s are Denistry and Medicine). Her argument is that making this more apparent to ourselves as teachers and our students as learners will enhance motivation and increase the participation level for learners. The implication is also that the knowledge base behind the subjects also impacts on how learning can be supported. If research can be shared we can switch from transmit to engage. Impact on individual and their staff development. How to get staff development culture established and rewarded. How to get recognition of scholarship explicit? And the challenge of research that goes from one area to another – part of the solution to combine research and teaching reviews. To bring out the recognition that research money and teaching money are interconnected. Gill had faced this challenge in both directions from a research institute to a teaching one. How will this approach appeal to businesses and employer engagement? Three facets to this are the HEFCE push, response to changing initiatives, and the nature of funding. But employers are not clear on what they want, student number funding is meant to be shared and changes such as she has suggested could help this. Approach is around engagement and matching needs with offers – her experience is that agreement is relatively smooth until funding issues cut in. Partnerships across universities puts pressure on cultures, what is their role? Her answer included the need to share experiences in this area. I asked a question about the distinction between “research-led” v “research-based” – I think this is important for our work on courses in the area of Educational Technology where we want our learners to join the research community. We know this has worked not least because we know the impact of some of our own graduates. This led into to a question expressed in terms of the practice and community that we need to support. I asked a question about the distinction between “research-led” v “research-based” – I think this is important for our work on courses in the area of Educational Technology where we want our learners to join the research community. We know this has worked not least because we know the impact of some of our own graduates. This led into to a question expressed in terms of the practice and community and I felt there was a connection with our experience that came through as she talked about motivation and the need for a knowledge base for subjects (maybe that knowledge base could be provided by open resources such as OpenLearn). Susan Levy & Pete Cannell are from the OU in Scotland where there is a different framework that involves working across the sector on themes including “The first year experience”. The initial point is that the very first experiences for students of what happens in the first weeks can make a difference to what happens next. For the OU this is reflected in the high drop out in new students (30% before the first assignment). The suggestion is that students need to feel part of a University socially, in particular through peer mentoring. An experiment was carried out with 9 students reflecting on their own experience in a FirstClass forum supported with 2 mentors, they had hoped for about 100 students and the 9 students appeared to be keener on joining in than the average student. Interesting was the “redundancy of the mentors once the assessment and formal support cuts in – of course this corresponds exactly with the fall out time so that makes a lot of sense. The considerations in questions went beyond the email towards the idea that we need to build as a distance university better ways to support the concept of finding life-long friends that occurs in other universities – and that social tools have a role to play. OpenLearn has also built up areas where people considering study and also studying have supported each other – it could well be beneficial for such supporting groups to lie outside of normal systems.